The Association for Truth in Pet Food (ATPF), an advocacy group established by Susan Thixton, the publisher and founder of The Truth About Pet Food, recently published the results of an unprecedented pet food testing project conducted by U.S. labs late last year. The results reveal serious concerns for pets and for the human families that purchase and handle the pet food. Testing results show that some of the most widely-purchased brands in the U.S. and Canada contained high levels of dangerous mycotoxins, problematic nutrient concerns and/or numerous bacterial contamination risks, including antibiotic resistant bacteria the FDA terms as “qualifying pathogens”. Funding for the project came solely from consumers, who raised nearly $16,000 via an Indiegogo donation campaign. 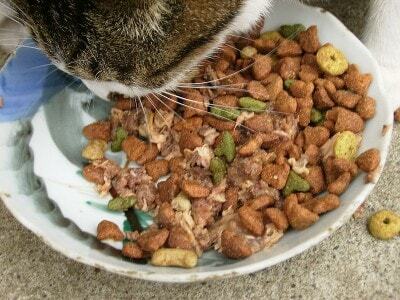 Meow Mix Tender Centers Salmon and Turkey Flavors Dry Cat Food tested positive for seven different fungusbased toxins (mycotoxins). On an industry standard risk scale (Risk Equivalent Quality) 0 = no risk, 5 = Low Risk, 10 = Medium Risk, 20 = High Risk — this Meow Mix cat food scored 70. The mycotoxins found – and at the levels found – “can cause tremors and convulsion, bloody diarrhea and lower immune response” in cats (quote from Dr. Dr. Tsengeg Purejav of INTI Service Corporation.). This cat food also tested to contain numerous bacteria including two bacteria the FDA terms as “Qualifying Pathogens” posing a “serious threat to public health”. Hill’s Prescription Diet C/D Urinary Tract Health Canned Dog Food tested to contain 7.72% calcium – almost three times the legal limit of calcium (AAFCO 2.5% maximum) allowed in an adult dog food. Mycotoxin Risk Equivalent Rating was at 16 (20 being High Risk), and contained numerous bacteria including two the FDA terms “qualifying pathogens” posing a “serious threat to public health”. Nine of twelve pet foods tested to contain one or more bacteria the Food and Agriculture Organization of the United Nations states linked to “putrefaction” of meat (putrid meat). Thixton urges consumers to contact legislative representatives in their states, and provides a sample letter on her website.For more information, and to read the full report, please visit The Truth About Pet Food. January 12, 2015 update: Since the results of this study were published, some veterinarians and food scientists have raised questions about the validity of the results. I applaud Susan Thixton for commissioning this study, but some of the responses have raised concerns for me about how the results were obtained. I will provide more information as it becomes available. Oh my, that’s awful. I’m glad I read this, though; it will definitely help to know what not to feed my pets. The toxic ingredients in the food we consume is bad enough, but harming animals is a whole other story. While I’m sure hurting our pets is not their intention, it’s not about what they meant to do, it’s about what they did do/continue to do. Hopefully more people are educated about this and know what they are putting into their beloved pets’ bodies. Very great post, thank you for sharing. Finally! Glad the report is out so more pet owners will think about what they feed to their beloved ones. I am so glad this is out there and I am shocked (well I suppose I shouldn’t be) by the backlash she is getting from putting this information out there. It really is just sad. there is no regulating this to perfection, but there is to do better. RIght now they are self policing, and we know where that gets us. seems the source website either does not exist or is down. It’s working for me, Michelle. I think she’s probably been getting a lot more traffic as a result of this, so maybe she’s had intermittent outages. I would try again. Pet foods are like TV stations, hundreds of channels but very little worth watching. I applaud Susan for this historic endeavor. I now mostly patronize manufacturers who offer transparency of their ingredients and sourcing to customers, Primal being the main food for my cats. Susan has this list on her site and I find it to be very useful. Maybe this is why my kitty seems to have a “sensitive stomach” now and then. It could be that the food is sometimes contaminated! How terrible! She is very picky, but I recently tried Sheba cuts which claim to have more meat and no grains. She ate the chicken variety so I hope it’s better than the Friskies she’s eaten most of her life. Standards need to be enforced so we can feel comfortable feeding commercial brands. Zoe will be 16 in a week or so and just won’t eat raw. She’s had blood testing and except for the occasional vomiting she is healthy. Just want her to live the rest of her life in health and comfort! In the 30+ years that cats have graced my life, first as strictly outdoor buddies (Mother was allergic) and now as strictly indoor, the thought occurred to me that the outdoor cats seemed to be healthier overall. Except for the prevalence of FLV, and early deaths to cars, they were stronger, more robust, and could withstand even the harshest Ohio winters. We didn’t buy cat food for them–they existed solely on whatever they could catch, and on table scraps (Mother believed in meat and potatoes for us so there was always meat). And likely on whatever they scavenged from friendly neighbors. Whereas the cats I have now, though they range in age from kitten to 20, seem to have more “issues” than you’d think, and they eat a balance of higher-quality kibble (dry) and wet food. Yet, I lost one just short of 10 years old last year from CRF; the two eldest both have kidney disease (one early, one ??? ), the brother to the CRF cat has urinary crystals; and there have been rampant tooth decay and abscesses. My eldest has no teeth whatsoever–they all fell out or were reabsorbed. Contrast my Core Four with the two young kittens I adopted from my back deck this summer, and their 3-5 year old feral momcat that came in to be fostered in the fall. They are huge, muscular things. They grew up outside and momcat survived last winter (I’d seen her outside for months but she was too skittish). I’m not sure I’m ready to go raw, but I do think that just as it benefits us, eating real food as opposed to convenient processed “food product” makes all the difference. I’m growing more and more convinced I lost my Blue not to kidney failure, but to food failure. It simply wasn’t healthy enough to sustain him, and his organs shut down from lack of proper nutrition. Perhaps funding can be raised for further studies. I’d like to see a complete overhaul of the pet food industry and a radical reduction of pets lost to horrific, wasting diseases that could have easily been prevented. Your observations are so true, Jeanne. Vets didn’t start seeing an increase in degenerative diseases in pets until the arrival of commercial, highly processed foods, especially dry foods, in the 1970’s. Of course, it could be argued that pets also started living longer lives and that some of these diseases are a consequence of aging, but I believe that nutrition plays a major role in health and disease. Processed foods cause all sorts of problems for both pets and humans. a cat with diabetes and two who blocked with urinary crystals caused me to go raw.. my cats are so much better off for it..
Jeanne – I too have cared for a large number of cats over the last 30 years and I have always fed them foods with no by-products or junk ingredients to the extent possible. More recently I’ve switched to a raw chicken diet based on Dr. Lisa Pierson’s recipe http://www.catinfo.org/?link=makingcatfood as well as Human Grade Soulistic wet Cat food. I totally agree that a steady diet of toxins is contributing to health issues ranging from diarrhea caused by bacteria from pet food (veterinarians never diagnose food as the cause) to serious and often fatal diseases. Another factor that no one mentions and veterinarians don’t want to admit or discuss is OVER-Vaccination. YEARLY Vaccines are totally unnecessary and result in major health problems including chronic kidney disease BUT they are a HUGE profit center for Veterinarians which is one reason they try to force people into yearly vaccines. I thought of this when you mentioned outdoor cats seeming healthier. In addition to diet, they most likely are not getting YEARLY vaccines. Dr. Pierson has a lot of Vaccine information and why NOT to vaccinate beyond the first year – http://www.catinfo.org/?link=vaccines and Dr. Becker has similar information here http://www.drbeckersbites.com/pet-vaccinations. Our oldest cat is over 18 and has never been to a Vet for anything including vaccines beyond the first year – given by her original owner, a neighbor. Our cat with the most health issues passed away at 16 but had way too many vaccines before I realized how unnecessary and harmful they are. I agree with you, Scout. In the interest of accuracy, I’d only like to make a minor correction to your statement on vaccines. Current vaccine guidelines (by the American Association of Feline Practitioners and other veterinary organizations) are more conservative, and generally only recommend vaccination every three years. However, you are absolutely right that there are still veterinarians who recommend annual vaccinations. Studies have shown that immunity for many vaccines last seven years or longer, and I agree with Dr. Becker’s approach to minimize vaccinations as much as possible. Ingrid, yes the AAFP guideline of every three years is much more reasonable than yearly vaccines, but from (hundreds) of comments I’ve read over the past few years, a huge number of veterinarians and Vet. hospital chains throughout the US are still trying to push their patients into yearly vaccines in spite of the AAPR recommendation. Banfield Pet Hospitals, located in over 800 Petsmart stores, sells prepaid Wellness Plans which include yearly vaccines http://www.banfield.com/preventive-care/optimum-wellness-plans/cat-wellness-plans. They are owned by MARS which as you may know owns 35 Pet Food Brands including prescription diets. Since over-vaccinating is known to cause illness in SOME animals over time, and veterinarians are who people seek treatment from, there is a monetary incentive to require yearly vaccines. VCA Animal Hospitals require proof of yearly vaccines for all patients they see. I believe that toxins in pet foods combined with over-vaccination is resulting in increased cancer, diseases, and premature death. My thinking is that effective vaccines require a response from the immune system, and if the immune system is already fighting the bacteria and other toxins in a pet’s daily food, its immune system can become overwhelmed, resulting in more than just mild diarrhea. Is there a reason why the links to the entire report done are not working? This is a great article!! THANK YOU!!!! The link is working for me, Christine. Maybe their website was down earlier – try again? What’s really shocking that is some of these brands are widely assumed to be better for your pet than other brands. Agreed, Summer. And therein lies one of the big problems with big pet food: it’s all about marketing. Unfortunately, I think you’re right, Larry, both about the toxins in our own food, and the bottom line. I believe that a consumer’s best defense is education. Egads! It’s time people realize they could be poisoning their pets! When I get home, I’ll check for receipts and return some canned cat food to the store. I just emailed my Representative!